Why watches are not good products to sell in Dropshipping? A lot of people or Dropshipping gurus often talk about which niches are best for Dropshipping. There are many niches which are suitable for different kind of audience. Its not easy for any Dropshippers to actually find a perfect niche for their Dropshipping shops. When its actually hard to find niche for Dropshipping business isn’t it better to know what kind of niches should be avoided? We have seen so many niches that are there but never get enough success. People go for it and end up with no profit. We will tell you about 3 niches which you should avoid at all costs. 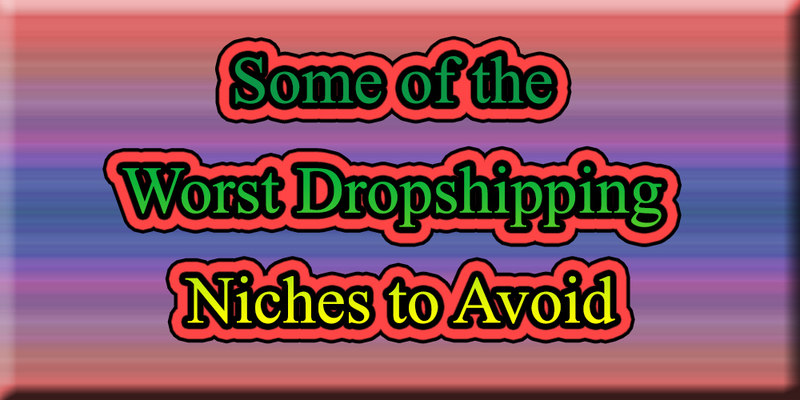 We will talk about 3 Dropshipping niches to avoid. Read on to know about them. The first niche that we will talk about is watch niche. We see so many Dropshipping stores selling watches but it doesn’t reap much profit. Sales of watches is so slow that there are some Dropshipping shops that sell as minimum as one watch per day. This also applies to jewellery like men’s bracelets but we will talk about only watches here. Watch stores are not very profitable when it comes to Dropshipping business. There are so many Dropshippers including beginners sell watches. Its hard to understand why they do so when they can simply sell stuff like hunting gadgets. They also have a section called luxury watch on their store which will not get enough sales. The first reason being the cheap watches on AliExpress. Due to the low cost of watches on AliExpress it provides very low-quality watches. You buy watches at the cost of $5 from AliExpress which is fine because $5 is not that much when it comes to the quality of those watches. The problem arises when you try to sell those $5 watches at the cost of $20 at your store. Plus, there are additional shipping costs that you take from your customers. Your customers are not going to spend $35 for a watch that is so low quality wise. It is not worth to buy that costly watch when it doesn’t meet certain quality standards. Also, people already have an idea that these watches are there on AliExpress. We are not telling you to stop selling watches but we are suggesting you to find good quality watches where people can leave good reviews after buying and other people can read those reviews and buy your watches. Watches used to be a good niche a few years ago but not anymore. You can not have enough profit by selling watches anymore. There are a few stores which just sell general women’s clothing. There is not even a theme of that clothing. What these Dropshippers do is that they just go on AliExpress and get all general clothing items and put them on their store. These clothing items mostly constitute clothes which are very low in quality along with horrible rating and returns. People don’t usually want to buy these products. The reason behind this is that there are already so many prominent retailers in the market that already sell all sorts of clothing items which include clothes of expensive as well as low cost. There are already so many companies like H&M, j.crew factory, and other various clothing companies. Uniqlo is one clothing company that provides amazing quality products at a very low cost. You can’t afford to sell general clothing items as they are not as appealing as they need to be for getting sales on Dropshipping stores. You need eye catching products for your store and general clothing items do not attract as much people as you need for your sales. Why would people buy your clothing items when they can easily buy same kind of products at much cheaper rate from a nearby physical store? Even if you somehow convince people to buy products from your store there are so many issues that you will face like sizing issues and quality issues because clothing on AliExpress is very bad n terms of quality. So, we highly suggest you not to sell general clothing items on your store as this niche will not attract people or stand out among all the other niches. If you still want to sell clothing you will have to customize it and make your own brand which needs huge amount of efforts and time. Why would anyone want to take up so much trouble? Second thing that you can do if you want to sell clothing items is that you sell niche clothing items. For example, you can sell dragon ball clothing, anime clothing or items like tank tops etc. Niche clothing store do really well in terms of sales. You can also go for selling print on demands products on your store as they have gained a lot of popularity in the current scenario. You can print any graphic on clothing to fit any niche as you want. Print on demand is famous when it comes to Dropshipping. So, you must avoid general clothing niche to save yourself from trouble. General lifestyle items include basic kitchen items like spoons or cleaning products. These are the kind of products which people don’t notice so well. Dropshipping is mostly about eye catchy items which can attract more and more audience. You need to built a desire in people to buy those items. You should sell items on seeing them people just want to buy them instantly. For example, if you sell a cool necklace that is very rare in market that can be very appealing for customers. Whereas, general lifestyle products are less in demand. Nobody is willing to buy them even if you use all sorts of marketing strategies on them. They will still prefer to go to local stores and buy. You can get impulse purchase out of general lifestyle products. If you want to sell lifestyle items then you have to put very trendy items on your store. Don’t base your entire Dropshipping store around general lifestyle items. This will not work. So, those were the three niches that you should avoid. They will keep getting worse and your Dropshipping store will not grow.